Mother Mercy Healthcare project uses textured glass panels to define individual spaces, create privacy and add visual drama. Nathan Allan Glass Studios Inc. provided the glass and systems: Featured throughout the project, “Mirage” kiln formed glass from Nathan Allan Glass Studios creates functional, yet spectacular partitions. 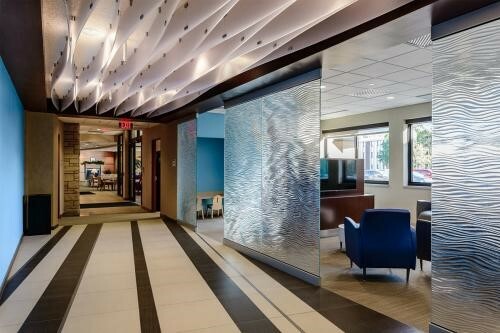 The panels employ a free-flowing pattern with fluidly shaped lines of texture and have an anti-microbial, low maintenance quality, designed for healthcare applications. The architectural glass partitions are formed with ½-inch thick, low Iron, safety tempered glass. Low iron glass, specified by HDR, the project architect, appears as a white, crystal-clear textured glass. 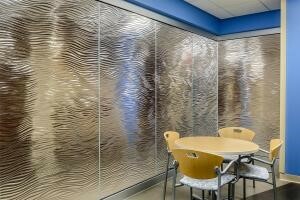 The project incorporates various sized panels up to 5 feet by 10 feet. The more detailed and stronger ½-inch panels allow for frame-less vertical edges, reducing the amount of required hardware. The continuous pattern design creates a seamless appearance and camouflages separation lines. Call us today! We will help you create your next great design with Nathan Allan Glass Studios Inc.